Blend the tomatoes, onion, garlic, and chile in a blender until smooth. Add the chicken bouillon, salt, and pepper, and blend a few more seconds. Pour, and blend a few more seconds. Pour sauce into a small saucepan and simmer over low heat about 10 minutes. Set aside and keep warm while preparing the chiles. To remove the skin from the chile, roast it over a burner flame or in a skillet. Roast until the skin bubbles and turns black over the entire chile. Place the chile in a plastic bag and wrap tightly. Repeat the procedure with remaining chiles. After 20-30 minutes, remove each chile and scrape softly with a butter knife to facilitate removing the skin. 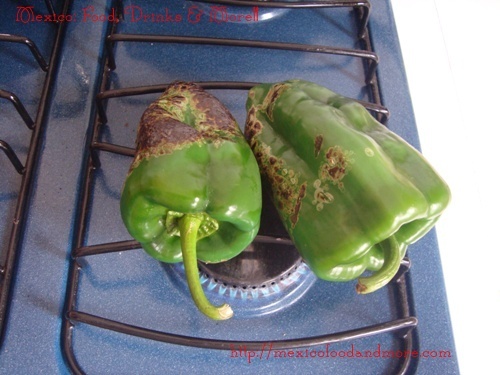 Rinse chiles to remove any bits of skin as necessary. Vertically slice each chile near the top by the steem. Cut just above the seeds inside the chile and gently pull the seeds to remove them as well as the veins. This will make the chiles less spicy. 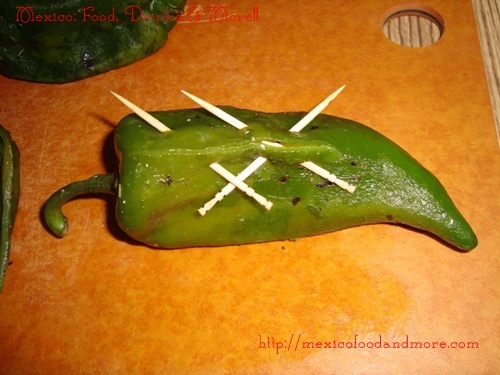 Fill chiles with thick strips of cheese, but don’t overstuff them, you should be able to seal the chiles easy with a couple of toothpicks per chile or with string. Separate the egg white from the eggs yolks. Beat whites until stiff peaks form. Add a couple pinches of salt and continue beating another minute. 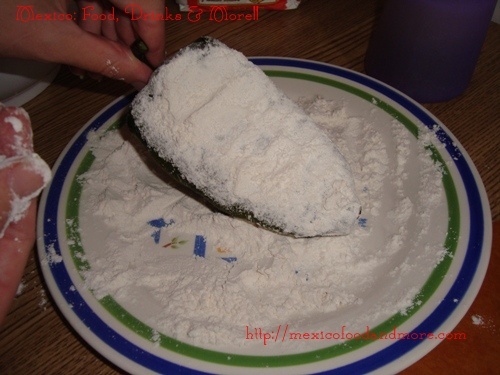 Add two eggs yolks and beat until combined. Add the remaining two yolks and beat well. 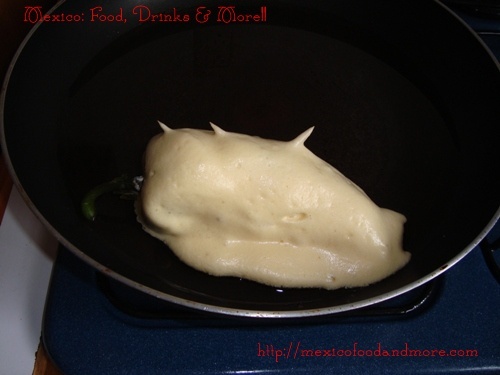 Heat about 1/4 cup oil in a large skillet set over medium-high heat until hot. Thoroughly coat a stuffed chile with flour, shaking off any excess. Holding the chile from the stem, dip it in the egg coating until completely covered, letting any excess drain off. Place the chile in the hot oil. Repeat steps with another chile. Using a spoon, drizzle some of the hot oil from the pan over the top of each chile to set the egg coating. After a few minutes when the egg coating turns golden brown underneath, gently flip the chiles to cook the coating on another side. Repeat until the egg coating is golden brown on all sides. 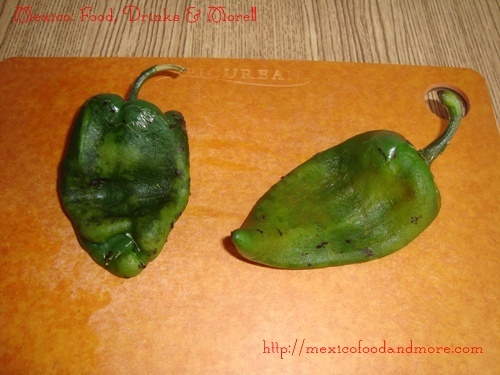 Remove the chiles from the skillet and drain on a pepper on a paper towel-lined plate. Repeat the entire process with the remaining two chiles. Serve hot with the tomato sauce. Add rice and beans to complete the meal. This entry is filed under Chiles, Vegetables. You can follow any responses to this entry through the RSS 2.0 feed. You can leave a response, or trackback from your own site. 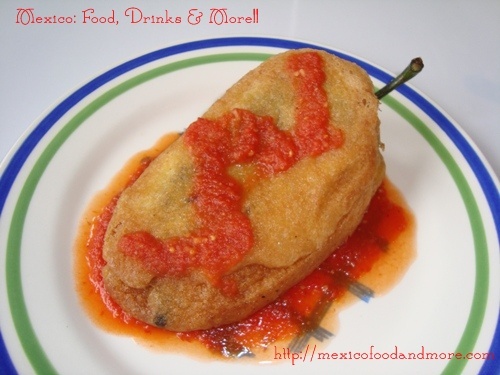 I love rellenos and your step-by-step is awesome!